You have destined at the very right place, as you will bliss by magnificent range of Compressor Connecting Rods and steel connecting rods. In addition, our connecting rods are available at the most reasonable price in the market. Also, we are the foremost air compressor connecting rod exporter in India. Connecting rods are made from aluminium alloys, carbon steel, bronze, S.G. iron by process of die forgings, die castings, gravity die castings, shell mouldings and are duly heat treated. 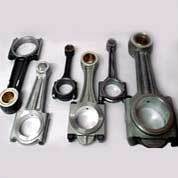 Connecting rods with integral bearings are available in undersizes also.